Como Audio comes to UK with four streaming radios | What Hi-Fi? The third company launched by Tivoli Audio-founder Tom DeVesto is landing on UK shores. Two years since the brand’s inception in 2016, and following successful sales in the US, Como Audio is launching in the UK with a four-strong range of networked, streaming, multi-room radios. Able to sync together to create a multi-room system, all four offer FM/DAB/DAB+ radio, aptX Bluetooth, internet radio and access to music streaming services, including Spotify, Tidal, Deezer and Amazon Music Unlimited. Musica (£650-£700, pictured top), which heads up the range, also boasts a built-in CD player. Amico (£450, above), meanwhile, flies the flag for portability. It’s made from marine-grade substrate with a real teak wood veneer for weather resistance, and has a slip-resistant silicone base and built-in rechargeable battery. The Duetto (£450-£500) and a smaller, more compact version, the Solo (£350-£400), complete the range. While the Como Audio app (iOS and Android) enables smartphone control, functionality can be controlled directly on the unit. DeVesto describes this on-unit control as passing the ‘guest-room test’, as any visitor to your house can take the playback reigns without having to download an app or sign in to an account. 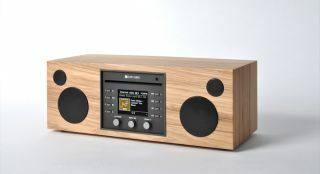 Amico aside, the radios are available in a choice of walnut, hickory, white and black finishes.